I am addicted to YouTube Analytics! Yes I know, this is a sad state of affairs - every day I check out my Learn with Dr Eugene O'Loughlin statistics provided in great detail by Google. This morning I noticed that on Tuesday (9th Oct) last the "Views" figure for the first time passed 5,000 for a single day. 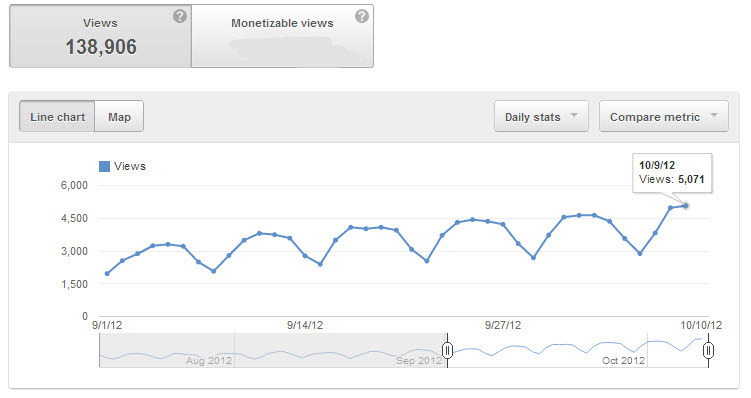 Since the 1st Sept the views have been steadily increasing and I have been expecting to hit this milestone for a while. The chart below is a screen grab from YouTube Analytics showing daily views from 1st Sept to 9th October during which time the channel received 138,906 views in total. You can also see a clear pattern where the figures rise during the middle of the week and drop at weekends. The lowest points are all Saturdays. Click image to enlarge for detail. Never in my wildest dreams did I think this would happen when I set up the channel, the lifetime views are almost up to 1.5 million now and the channel is the 96th most viewed in the world in the Life Long Learning Partner category in YouTube EDU. Today I have no classes, yet I will have close to 5,000 learners on-line from all over the world using my educational videos.